The U.S. Center for Disease Control announced that state health officials in Nebraska and Iowa have performed investigations within their states and have shared the results of those investigations with CDC. Based on their analysis, Cyclospora cayetanensis infections in those two states are linked to a salad mix. Without identifying the bagged salad mix brand names linked to the Cyclospora outbreak, Nebraska and Iowa state health officials said that the bagged salad mix includes iceberg and romaine lettuce along with red cabbage and carrots which "came through national distribution channels." 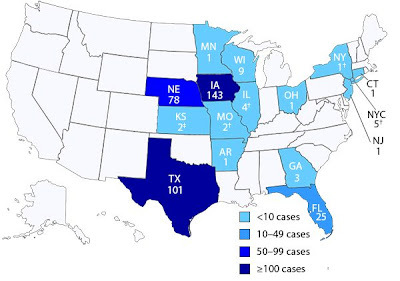 As of July 30, 2013, the CDC has been notified of 378 cases of Cyclospora infection from 15 states and 1 city: Iowa (143), Texas (101), Nebraska (78), Florida (25), Wisconsin (9), Illinois (4), New York City (5), Georgia (3), Kansas (2), Missouri (2), Arkansas (1), Connecticut (1), Minnesota (1), New Jersey (1), New York (1), and Ohio (1). In the U.S., most of the illness onset dates have ranged from mid-June through early July with at least 21 persons reportedly have been hospitalized in three states. It is not yet clear whether the cases from all of the states are part of the same outbreak. The CDC says that no common events (e.g., social gatherings) have been identified among the case patients. Currently, the average Florida case age is 57.5 years, with a range of 22 - 78 years of age. The current stomach bug case count consists of 14 females and 10 males. Onset dates of Cyclospora cases in Florida range from the beginning of June to mid - July. So far, Florida Department of Health officials say that they have found no links to common restaurants found among the 24 cases, as in other states. Additionally, no common food items or events, like a social gathering, have been identified among those affected. As of July 29, DOH officials say that there have been five patients hospitalized in Florida who were later released. According to the CDC, no food items have been implicated to date, but public health authorities are pursuing all leads. Previous outbreak investigations have implicated various types of fresh produce. According to the CDC, the time between becoming infected and becoming sick is usually about 1 week. Cyclospora infects the small intestine (bowel) and usually causes watery diarrhea, with frequent, sometimes explosive, bowel movements. Other common symptoms include loss of appetite, weight loss, stomach cramps/pain, bloating, increased gas, nausea, and fatigue. Vomiting, body aches, headache, fever, and other flu-like symptoms may be noted. Some people who are infected with Cyclospora do not have any symptoms. The CDC say that if not treated, the illness may last from a few days to a month or longer. Symptoms may seem to go away and then return one or more times (relapse). It’s common to feel very tired. The CDC reccommends avoiding food or water that might have been contaminated with stool may help prevent Cyclospora infection. People who have previously been infected with Cyclospora can become infected again.